Fort at No. 4, 267 Springfield Rd. May 4th & 5th 2019 (Saturday and Sunday) 275 years ago the townsfolk of Plantation Number 4 voted to create a fortified section of town. Reenactors/Living Historians personifying British and French troops, rangers, militia, camp followers, Native Americans, and sutlers gather to recreate events surrounding New England's involvement in the war. 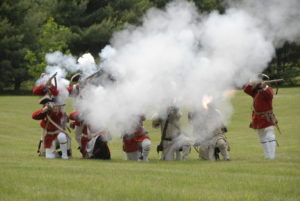 Included during this two day event are tactical battle reenactments, open hearth and campfire cooking, blacksmithing, textile production, and colonial trades.